Disney UP Wedding Ellie Badge, Greatest Adventure Wall Art - Printable Home Decor Inspired by Carl & Ellie "You and Me, We're in a Club Now"
Poster design inspired by the Disney/Pixar movie "UP." 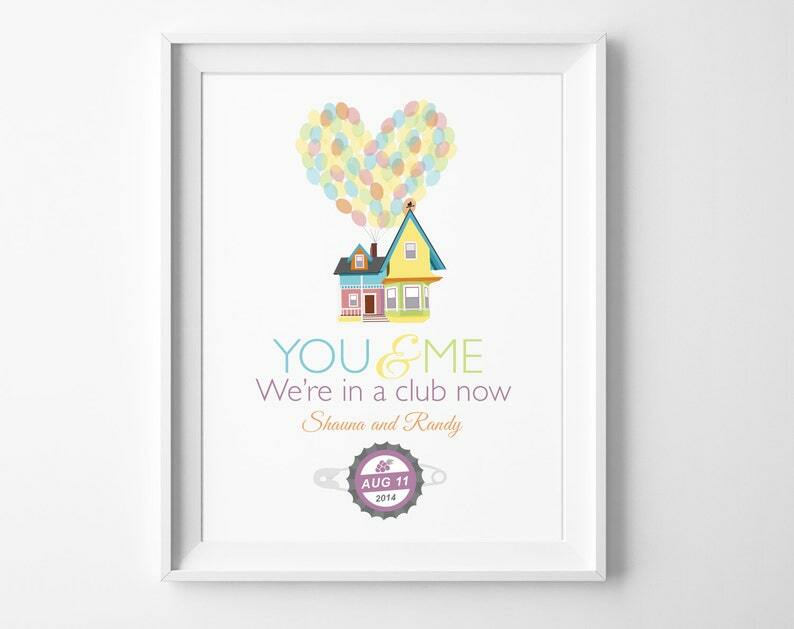 The design features a drawing of Carl and Ellie's iconic house at the top with balloons in a heart, and the words, "You and me, we're in a club now." At the bottom, it's personalized with your names and wedding date. The wedding date is inside of the Ellie Badge grape soda pin. I am currently only shipping within the US. I apologize for any inconvenience! 1. Select your printed poster size 8x10" or 11x14". The prints are unframed but fit standard frame sizes. 2. During checkout, please include your wording and color choices (if different). 3. Once I receive your details, I will contact you in 1-3 business days with a proof to review. I'll work with you until absolutely perfect! 4. Once absolutely perfect and you approve the proof, I will print and mail your poster to you. The posters include free US Priority Mail shipping, which takes 2-3 business days and includes tracking. Disney UP Wedding Invitation Caricature Design, Our Greatest Adventure, Carl and Ellie's House, Paradise Falls, "Adventure is Out There!" Best custom item ever. Loved by both of us more than any other picture in our home. I was very happy with the whole experience. Sameeha was very helpful and thorough in explaining everything step by step. I was more than thrilled with the end result. The print I ordered looked amazing and from the moment I ordered to the moment I received my print took less than a week. It will be a Christmas present for my wife and she's going to love it. Sameeha was so great to work with! She responds so quickly and got my print in the mail right away. Great graphics and nice print quality!